Written by F. Scott Fitzgerald, The Great Gatsby is considered by many to be a literary classic. It’s no wonder, then, that in the time since the novel was published in 1925 it has been adapted for the screen on numerous occasions. The latest of which hails from director Baz Luhrmann and screenwriter Craig Pearce, who’ve created an ambitious – and visually sumptuous – interpretation. Nick Carraway (Tobey Maguire), a bright-eyed writer turned bond salesman, strikes up a friendship with elusive millionaire Jay Gatsby (Leonardo DiCaprio) after buying a house across the bay from cousin Daisy Buchanan (Carey Mulligan) and her husband Tom Buchanan (Joel Edgerton). As their friendship deepens, however, it quickly becomes clear that Gatsby has ulterior motives. Signaling its arrival with an over-the-top, yet undeniably fitting blowout of visuals and flamboyance that captures the splendor of the roaring 1920s lifestyles, The Great Gatsby establishes itself quickly and powerfully, before Luhrmann and Pearce begin to slowly peel back at the ostentatious surface to reveal a more austere narrative, full of moralistic motifs and afflicted characters. 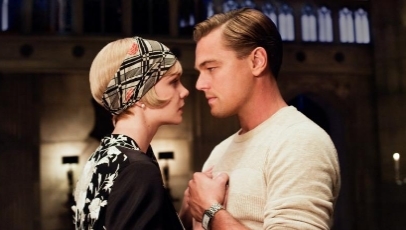 From here (the tension-filled scene where Gatsby and Daisy reunite at Nick’s house, in particular),The Great Gatsby finds its rhythm, striking a more suitable and bewitching balance between sumptuous visuals and sincere storytelling that calls attention to the characters’ struggles, which, more often than not, stem from their own skewered moral compasses (Tom cheats, Gatsby lies, and so on). It’s the script that it a difficult film to fall head over heels in love with. Nick is narrowed to nothing more than an omnipresent narrator thanks to both the nonplus framing device that’s been tacked on and Maguire’s weak performance, and Daisy’s chemistry with Gatsby feels almost trivial, though that’s partly due to Mulligan’s failure to realise the character outright. The performances from DiCaprio and Edgerton, however, are terrific, and Luhrmann’s direction is notably understated bar the odd overdone camera shot. In reality, there’s more to like about The Great Gatsby than expected, and the second half has more than enough intrigue, candor and charm (the soundtrack is used well) to endorse Luhrmann’s vision, even if it is unfavorably excessive. lukewarm film. brillinat decor but too centered on the acquisition of things.